With the London date of their tour clashing with Shrinebuilder/Wolves in the Throne Room's appearance I took the decision to head on up to Britain's second city to catch heavy metal's hottest property Enforcer and Aussie AC/DC-worshippers Airbourne on their sojourn across our land, deciding my historical slackness in catching Enforcer live must now come to an end. Naturally visiting a venue in a city largely unknown raises it issues - through bad luck and bad orienteering I completely missed Black Spiders' set and the opening moments of Enforcer's, but hey ho, on with the show. The hype machine that surrounds every release these days is usually wrong, hysterically so in some cases, but doubt me not when I say it is fully justified for Swedish heroes Enforcer. Not only do their songs rock harder and roll harder than any other classic metal competitor out there today (aside from the disappointingly unknown RAM) but they have a glorious attitude to boot – somewhere between the cocksure ironic swagger of Steel Panther and the underground passion of their revivalist- and label-mates Cauldron. Perhaps in an effort to match their live show to their profile the volume for much of the band's performance was deafeningly loud – too much even for my battle-hardened eardrums and much too much for the venue's sound system such was the lack of clarity found in the earlier songs of the bands set, the intricate lead melodies of the band clouded by shattering noise and singer Olof Wikstrand struggling to make himself heard over the top. Whether or not my ears adjusted to the volume or the mix was improved but the many songs aired from this year's brilliant "Diamonds" LP - Midnight Vice, Katana, High Roller, Live for the Night – began taking shape and revealing an identity that true to classic heavy metal form is as suited for live performance as it is home listening. 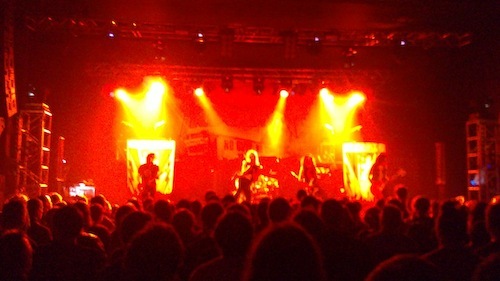 Despite this and the frenetic movements of the band, however, a disinterested air hung over the near full venue; apparently forty years after their fellow Brummies invented heavy metal few of its current inhabitants have any interest in today's brightest light, the floor offering as much movement as the British rail network after the recent 2 inches of snow. A lesser act might react accordingly but not so Enforcer, the unfavourable conditions tonight only strengthened this pack’s claims to the crown of heavy metal, though greater nights await them on their journey to the top. As evidenced earlier, and by the number of Airbourne and AC/DC (can't people be more imaginative?) shirts in attendance, there could be no confusion over the band Birmingham's folk most wanted to see. Such has been the dramatic rise of Airbourne the last few years, from AC/DC clones to erm, slightly heavier AC/DC clones, one must wonder if there is a viable future out there for anyone willing to plagiarise their idols hard enough. Success even in the field of copycat rock’n’roll does not come cheap however. Solid as a rock are Airbourne numbers "Diamond in the Rough", "Runnin’ Wild" and "Too Much, Too Young, Too Fast" the real star of the show and reason for Airbourne’s rise is the showmanship of Joel O’Keeffe. Bringing back the classic rock frontman guise like the 1970’s never ended, if O’Keeffe is not singing or soloing he’s chugging beers or riding the shoulders of a roadie through the audience....while maniacally soloing! 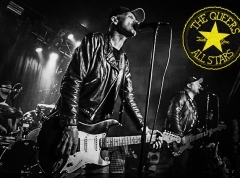 Much like their Aussie forbearers the band’s rhythm guitarist and bassist remain content in the background, allowing for the combined spirit of Bon Scott, Angus Young and Brian Johnson in O’Keeffe to lead the audience through the easily enjoyed lifestyle-defining hard rock of latest album "No Guts. No Glory." in the kind of budget-price AC/DC that Airbourne effectively are. Doing the ‘revivalist’ thing in an entirely different way to Enforcer Airbourne nonetheless bring the spirit of a bygone age into the modern day, with both proving that with enough spirit and no lack of balls, good old hard rocking heavy metal will never need bringing back from the grave – it will always linger in the hearts of it’s countless followers.